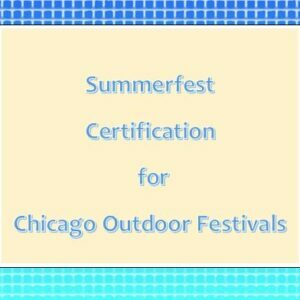 What is a Chicago Summer Festival Food Vendor Certificate and a Chicago Special Event Food License? The Special Event Food License allows a food operation at outdoor events within Chicago. The Summer Festival Food Vendor Certificate shows staff has the required training for safe food operations at special events. A copy of the certificate (or proof of course date prior to the event) must be submitted as part of the Special Event Food License application. So, to host a food booth at neighborhood festivals, special events or temporary food service events in Chicago – get necessary staff certified as a Chicago Summer Festival Food Vendor. The certification is good for one year. Add this training to a private food handler program or after a food sanitation manager licensing course. It may also be arranged as a separate private course. Certified Food Safety Programs is approved by the Chicago Department of Public Health to provide these certifications. We can also submit and expedite the documents to quickly qualify your operation for a summer food event.